Mia Lerm Hayes is a professor of Art History at the University of Ulster. Her family moved from East to West Germany in 1975 and she has worked in Northern Ireland for ten years. She recalls what life was like growing up in East Germany during the Cold War. Mia was born in the East German city of Jena in the late 1960s. Her parents had met around the time when the Berlin Wall was built between the two Germanys on June 15, 1961. An old map of London, bought from an antique bookshop, hung on a wall in the family’s living room as a daily reminder of the free world, which they knew they could never see. Despite (or because of) the parents’ university education – in Theology, which did not conform with the regime – they knew that Mia and her younger sister would never be allowed the same opportunity. The communist leadership’s punishment against anyone who opposed its regime meant that the children of those interested in human rights in the Eastern bloc would have to pay a heavy price. “My parents knew that their daughters would never be allowed to do ‘A’ Levels, study or have a proper job that would allow us to use our brains,” Mia now explains. When a parcel containing chocolate arrived from the west one day Mia offered some to a friend. “No, I don’t want anything from the class enemy,” the indoctrinated child replied. Knowing that their daughters faced a life of discrimination in the GDR, the Lerms applied in 1973 for permission to leave the Eastern Bloc. The fact that Mia’s mother had been injured in a car accident some years before meant that the Communist regime saw her as a financial liability and was happy for her to leave. “My mother had a car accident in 1970, which meant that she was left a ‘pensioner’ at the age of 28. She could travel to the West, because the GDR government let anyone who was on a pension go to the West and receive their pension there." This may have been a longer-term separation, but those in the West who agreed to help the family convinced her that she could return and enough money would be made available to pay for their release from the East. Even if permitted by the East German regime to escape to the West, each person had to pay a ‘ransom’ to leave the GDR. “It was 1975 and was in the middle of the Cold War and very early on in terms of expatriations,” Mia now recalls. It would take a full two years before the Communist regime would finally allow the family to leave. In that period moving boxes were constantly packed, ready to leave their east German lives behind within the required 24 hours. The fear that the Stasi was watching to see who helped the Lerms meant that only a family of close friends, who were already known to be active in the opposition, felt brave enough to wave goodbye to them at the train station. It would be another 32 years before Mia would see them again. The final remaining obstacle between the family’s freedom was the infamous Friedrichstrase train station, known to Berliners as the ‘Palace of the Tears’, as it was the final place where loved ones could embrace as a handful escaped while others were forced to stay behind the wall. Despite making it to the West, it was difficult to have left family and friends behind. Despite huge problems the family made every effort not to lose contact with their loved ones in the East. In 1989 both the Berlin Wall and then the GDR finally collapsed after tens of thousands of East Germany citizens took to the streets in what became known as the Peaceful Revolution. Later, thousands of former GDR citizens sought to discover whether or not they had been spied on by the Stasi, but Mia’s mother has chosen not to. “Mother never requested her Stasi file,” explained Mia. 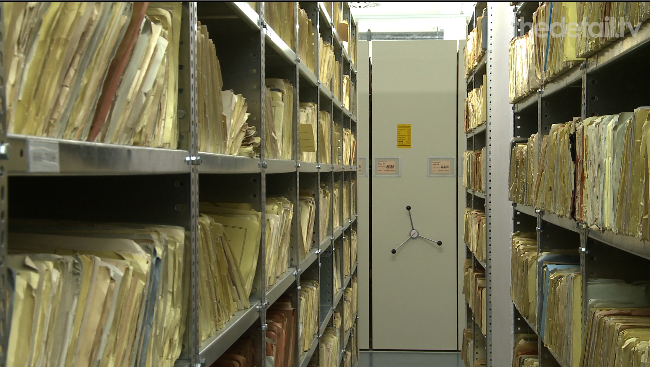 “I went to the Stasi Archive and wondered whether I could have a look at my family’s file, but I got a letter back to say that there were no files on children. Mia’s mother’s unbreakable determination that her daughters had access to a good and democratic education was a direct factor in her decision to move to Northern Ireland in the 2000s. “The link between my history and being here in Northern Ireland is very straight forward for me. While the University of Ulster art history professor believes there are lessons that her adopted home Northern Ireland can learn from her place of birth, she warns that it would be a mistake to try to impose a “one-size fits all” approach to truth recovery for victims. “I do think there are parallels, but not the kind of parallels you might find in the technicalities of simply saying ‘let’s use what happened to the Stasi files in Northern Ireland’. “If you say: ‘we’ll look at the Stasi archive and see what we might learn from that for Northern Ireland’ you’re making a lot of assumptions. You’re assuming that there are archives in Northern Ireland, and did the paramilitaries on both sides have archives? “What you are actually talking about are the crimes committed through collusion. You are talking about state violence. You’re assuming almost that it was a dictatorship here, which, in a systematic way, gathered information on those who were not supporting it, and you’re assuming that the state has not carried on doing the same. However, Mia believes that the intransigent approaches adopted by all sides in Northern Ireland remains a stumbling block to progress. “What we could learn is that there are more than just two sides. “What you see in a film like ‘Good Vibrations’ is that there was also a music community here, which didn’t care if you were from one side of the fence or the other; similarly with visual artists. “There was also the Civil Rights movement in the late 1960s and the tragedy of Northern Ireland is that the moral high ground that it had was not sustained as a model. Obviously it was considered by the government of the day to be dangerous; otherwise Blood Sunday wouldn’t have happened.